You put so much time and care into selecting just the right gifts for your friends and loved ones. 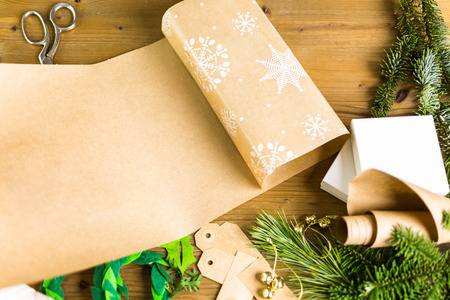 Get creative and have fun creating your own unique gift wrap. Then, at the last minute, you wrap it in some tacky Santa paper from the grocery store and stick a flimsy bow on top? Shouldn't the wrapping reflect as much thought and love as the gift? Creative gift wrapping isn't necessarily more expensive. But it does require a bit more time and thought. This is not a Christmas Eve project. Here are some innovative ways to decorate your gifts this year. Who knows - it may even slow down the opening frenzy. Creative gift wrapping paper choices range from expensive foils to freebie newsprint - and everything in between. You might want to consider a theme or at least a color scheme for your wraps. You don't want Frosty the Snowman paper next to elegant striped foils under your tree. That sort of spoils the effect. If you use kiddie papers for the kids, try grouping these presents together. It will make gift distribution easier on Christmas morning as well. Printed paper: Possibilities are endless. Give the kids some butcher-block paper and let them decorate it with the time-tested potato stamps. Or, cut designs out of sponges and sponge them on the paper. Or, stamp the paper with commercial stamps and color the design. This can be as funky or as elegant as your skill level allows. Painted Paper: Spray paint a design on with stencils. Decoupage and stickers: Cut out parts of old cards and glue them on regular gift wrap for a personal touch. Or even better, cut a frame out of old greeting cards, insert a photograph of your family and glue it onto a pretty foil wrap. The natural look: Tie brown bags with raffia for an organic effect. Unusual materials: You don't have to wrap with paper at all. Use whatever you have around your house - old rolls of wallpaper, corrugated cardboard, even comic papers. Wrap a special present in velvet or silk. Wrap a small gift in a beautiful scarf for a gift within a gift. Themed wrap: Wrap gifts in paper or objects that reflect the nature of the gift. A traveler's gift or a gift for a car could go in an old map. Enclose a music teacher's gift in sheet music; a cook's gift in butcher paper or kitchen towels. You get the idea. Another gift wrapping option is to skip wrapping altogether - just box or bag it. Gift bags: Present small gifts in special bags of silk or velvet. Or, put it in a bought or homemade stocking. This way the packaging becomes an integral part of the gift, instead of something that will go out with the next day's trash. Decorative boxes: Some boxes are so beautiful they don't need any embellishment. For a natural look, consider boxes of corrugated cardboard. Tie it up with raffia and a sprig of berries and you're done. Let the kids decorate plain white boxes by drawing, stenciling or stamping designs on them. Or trim them with old recycled greeting cards. Do yourself a favor and throw out all those tired stick-on bows of Christmas Past. Resolve that this year, you will put a fun finishing touch on each package. Wire ribbon makes a very elegant finish to a gift. Cloth ribbon: Wired cloth ribbon makes a very easy and elegant finish to a gift. But don't just make a bow and stick it on top, wrap the ribbon around the gift. Natural adornments: Jazz up raffia or jute bows with pinecones, berries, sprigs of holly, dried flowers, or even candy canes. Girl power: For the little misses in your family, fashion bows out of scrunchies or hair ties. Or, work earrings or bracelets into a silk bow. Guy stuff: For little boys, tie little model cars onto the ribbon. Cooks: Cooking paraphernalia such as cinnamon sticks, colorful measuring spoons, whisks or spatulas will spice up an ordinary bow. Try to think of a clever way to disguise the gift with something that hints at what's to come. This is especially good for gifts that are not very visually exciting, such as gift cards. Cooks. Wrap a cookbook in a dishtowel. Gardeners. Encase tools or gloves in a flowerpot. Coffee lovers. Tuck a Starbucks gift card in a special mug. Busy moms. (Are there any other kind?) Assemble ingredients for a special recipe (your recipe for apple pie, lasagna, etc.) in the appropriate dish (ceramic pie plate, baking dish) and tie it with a festive red bow. Don't forget the recipe! Girls. Wrap all you need for a slumber party (popcorn, fingernail polish, etc.) in a fuzzy bathrobe. And for the traditionalist in your life, wrap at least one special gift the old-fashioned way. Find a box with a detachable lid. Wrap the box and lid separately and secure with a fabric ribbon. On Christmas morning, the recipient simply tugs at the bow and lifts off the lid. Just like in the movies. Chances are that box will last longer than the gift.